Most grill and barbecue cooking neophytes just stick to the tried and true grilled hamburger, hot dogs or sausages when they fire up the old outdoor grill. Who can blame them? They are easy, fun and always tasty. However, there are many more options when cooking on an outdoor grill. Don't get stuck in a rut, try something new and you may be surprised. There are many styles of delicious food that can be prepared on an outdoor grill. 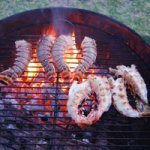 From good hearty burgers or steak to gourmet bacon wrapped grilled quail, roasted pheasant or a rack of dry rub barbecue ribs, all these and more are possible with barbecue cooking. Direct Heat Grilling - Direct heat cooking means that your food cooks directly over the heat source. This is high heat cooking with direct intense heat from your coals or gas fire. This is the typical grill cooking that most people are familiar with. It is how most of us cook burgers, hot dogs and steaks on the barbecue. Because it is high, intense direct heat, it is ideal for smaller cuts of meat, food that you don't want the interior to cook entirely (like rare or medium-rare meat and some vegetables), and foods you want a nice intense seared caramelization of the surface. However, this type of barbecue cooking is not appropriate for larger cuts of meat or other foods that take a long time to cook. This would result in a burnt exterior by the time the interior is done. Indirect Heat Grilling - This form of barbecue cooking allows slow cooking of larger roasts. This is ideal for larger cuts of meat, whole poultry or anything you want to cook slowly so that the interior is well cooked. 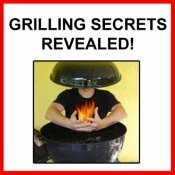 The general idea is that, rather than cooking your food directly over the heat source, your food is not directly over coals or fire and the lid of your grill is closed. This allows hot air and smoke to accumulate inside the grill and roast the food similar to how it would cook in your oven, by heat convection. Therefore the surface of the meat is not exposed to high radiant heat and does not sear and burn as fast. You can cook a large chicken, roast, leg of lamb or rack of ribs for an extended period of time (hours even!) until the interior is well cooked and even falling off the bone! Yum! Smoking - Smoker cooking is similar to indirect heat cooking in that generally there is lower indirect heat used. However, in addition, smoking woods are used so that the smoke that is cooking the meat slowly is permeated with intense wood flavors. There are a host of different woods used for this purpose, each imparting different distinct aromas and flavors. Hickory and mesquite are two of the more popular woods but others are used as well. Smoking can be done in your standard grill or fire pit but there are also specifically designed smokers made to optimize smoker cooking. Rotisserie - A rotisserie is a barbecue spit which holds your food and turns it over the heat slowly. This is the ultimate way to insure even barbecue cooking and makes slow roasting on a grill easier. You don't have to keep turning your roast by hand. The principle is similar to indirect heat cooking in which you are trying to avoid any one part of the food getting too much direct heat for too long so that it doesn't burn, resulting in evenly cooked food that is tender and juicy. There are many grills made with a built in motorized rotisserie. Kits are also available to attach a rotisserie to your charcoal or gas grill. Tin Foil or Vegetable Basket Cooking - Some vegetables can be hard to cook directly on a grill grate, either because they are delicate and tear or stick to the grill or because they are too small and fall through the grates. The solution is to wrap your vegetables in tin foil with some seasoning and olive oil before placing it on the grill. 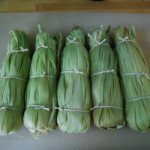 This allows them to steam in their own juices and cook gently. However, this form of barbecue cooking does not impart much wood smoke flavor. Another option is to buy a metal basket that sits on the grill and has small holes in it to hold your vegetables while they cook. These are available at most grill supply stores. Other specific food holders are available for fish, corn and other foods that hold your food safely within a cage basket while it cooks on the grill. Skillet or Pot Cooking - Another barbecue cooking option for cooking vegetables or fish on the grill is to simply put a heavy-duty skillet or pot directly on the grill. You can even make sauces and soups this way. I like using a cast iron skillet or pot for this. This way you can do all your cooking outside, not having to go into the kitchen to prepare your sauces, vegetables and soups. It is critical to have high, direct heat to make this work. Place your pot or skillet over a big pile of hot coals or directly over a gas burner turned up high. Some new gas and natural gas grills have size burners next to the grill. This is a convenient addition that allows you to cook all your food in one place. Done learning about the types of barbecue cooking? 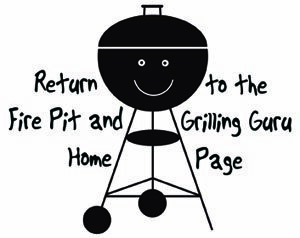 Go back to the grill cooking page.